Restoring Vehicles is What We Do. The owners, technicians, and staff at Montclair Auto Body love our jobs because we are providing a valuable and necessary service to people every day. We restore vehicles—that is what we do. We provide quick, high quality collision repairs, and help with the claims process after an accident. We also recondition vehicles, and simply make cars look great. It’s truly satisfying to see our customers’ expressions when we return their vehicles. That’s when we know we’ve done our job, and done it well. Montclair Auto Body specializes in collision repair. The experience and ongoing education of our technicians and staff contribute to the top quality of repairs at our shop. 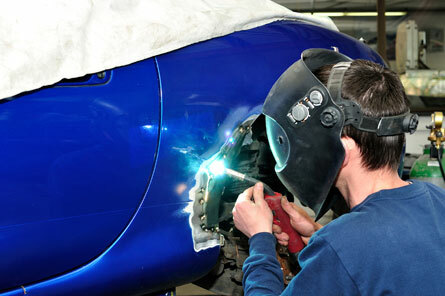 Continuous training enables us to restore vehicles to manufacturer specifications with confidence and efficiency. Customer safety and satisfaction is our #1 priority. Joseph and Margaret Govea founded Montclair Auto Body in Montclair, CA in 1979. With Joseph’s experience as a metal technician and auto collision instructor and his family’s support, the shop was an instant success. From the beginning, Montclair Auto Body has provided high quality repairs to locals in Montclair, Inland Empire police departments, and community charity organizations. The demand for Joseph’s services grew so quickly he was forced to look for a larger facility. In 1985, the Goveas relocated their collision repair shop to Ontario, but kept the name Montclair Auto Body. Through and after the move, their reputation for being one of the best collision centers in the Inland Empire stuck with them. Today, the Goveas maintain the same high standard for quality repairs and outstanding customer service they started with. The family has always been highly involved with the success of the business, and still is today. When you bring your vehicle to Montclair Auto Body for repairs, you’ll have the opportunity to talk to one of the owners. You can expect a business and a family that has genuine concern for your wellbeing. Joseph Jr, the owners’ son, has been working at the shop for over 25 years. He currently writes estimates, orders parts, and manages production. Michelle, the owners’ daughter, manages the front office personnel and performs accounting operations. Marvin has been with Montclair Auto Body for about six months. On a daily basis, he orders parts, checks parts upon arrival, and performs quality control checks on repaired vehicles. He also gives customers rides home in the company shuttle. Bianca has been with Montclair Auto Body for about a month, working primarily as our claims assistant. She makes initial contact with customers, schedules appointments and repairs, calls the rental company, updates customers on status, and answers phones. Ariel started with Montclair Auto Body shop about a year ago. He performs all structural, non-structural, and cosmetic repairs. He also handles some mechanical repairs. Ariel has a true passion for cars, and he’s a very positive person who takes great pride in his work. Antonio has been with us for about three years. He handles structural, non-structural, and cosmetic repairs. He’s very attentive to detail, and takes pride in his work. In the two years he’s been at Montclair Auto Body, James has continuously demonstrated his passion for painting. He performs all of our color matching onsite. Miguel has been with Montclair Auto Body for over 15 years. He performs color sanding, and polishes vehicles after they have been painted. Once a vehicle is fully assembled, he thoroughly washes and cleans it to remove all dust and dirt before delivery to our customer.